The Prop Den • Deconstructing the ANH Vader Paint Job -- What do we know? 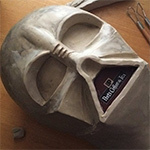 Post subject: Deconstructing the ANH Vader Paint Job -- What do we know? So we know that the paint job on the ANH Vader helmet is very complex and that our ideas on it have, like everything else in this hobby, evolved over the years as new references have become available. I thought we could start a new thread to hash the subject out in detail and consolidate our knowledge into one place. I have long suspected that the paint work was an evolving process throughout filming--while there were large areas of the face mask that were painted gunmetal other areas may have had paint added to them as the needs of the shot required and as the helmet was retouched (stating the obvious here no doubt). So the critical questions I think are where is gunmetal paint applied and which directions do the brushstrokes follow? If the area appears to have a darker or lighter gunmetal is this because of a thinner or thicker application of the same color, use of a different shade (which seems unlikely to me but I'm open), a paint mixture, drybrushing, or something else like lighting? Well, we can start it off with a picture of the original face mask. What we know is that it started out all black. Then the gunmetal weathering came along. How that was applied and where is still up in the air - but basically, it was applied to about 95% of the face mask in one form or another, from nearly full covering application to barely highlighting the surface. It is not a smooth, constant, sealing application like seen on the ESB/RotJ helmets, so it is a good question to ask how, where and by how much the gunmetal was applied. Two more pictures of the ANH paint job. One thing you'll notice in the first picture is that the front edge of the upper eyebrows are painted black - whereas they were gunmetal in ESB and roughly 50/50 gunmetal and black on some helmets in RotJ. Well, I personally believe the black scuffmarks on the wearer's right side of the mask might - might - be due to scrapes against the inside of the helmet. Also, I've not really believed the paint scheme to be two toned. I feel there are purposely gradations of metallic gray. Some surfaces are painted on; some other surfaces (e.g. mouthwall on wearer's left) appear more drybrushed. It's funny comparing the shots of the tabs. On the video, it looks white, which may have thrown off some fans. On the larger hi-res shot, the tabs look clear. The video screengrab's appearance may be due to the tabs catching overhead lighting. Possibly a slight translucence would cause it to illuminate and appear white.... dunno. some of if not all my thoughts are the same. but this is just my theory of what i think that may have been done when they painted the helmet. i think that possibly that different areas of gunmetal were applied in either multiples or singular layers. and possibly the mixing of silver with the gunmetal to give certain areas a different or lighter look. and i think that "possibly" different sized bristled brushes were used to apply them (not deliberately). this is why some areas appear to be lighter and darker than one another and or have more of the black streaking than others. such as the inside of the nose, the nose bridge and the face of the left cheek all seems to be more solid and even a lighter color and with less streaking (could be due to more layers applied). while the outer mouth walls and the rest of the faceplate appear to have more of the black streaking. the smaller areas would call for a smaller brush to use for finer detailing in turn could have had finer bristles. where the mouth walls and the rest of the helmet could have been done with a larger paint brush in turn could have had larger bristles. a lot say its lighting. which lighting does play a major role in the appearance of the paint scheme. but i think its a combination of all of the above. and we probably will never know. hopefully someone who actually worked on the helmet or painted it would step up and tell us how it was done. or show some clear photos that can show what was done. because all we can do is speculate on the areas that we dont have definitive proof on how they were painted. would be cool if Lucas would release a book to reveal the actual paint scheme. probably will go down in history as one of the greatest mysteries that will never be known.. Certainly initially all black as Carsten pointed out. The brushwork seems to be fairly thin and quick because it is obvious how in some places where there was abrasion of some sort during handling that the gunmetal is worn off revealing the black paint underneath. It is reasonable to deduce that the black paint would have been sprayed on, as indeed we see paint drips on the mask (notably the chin and Vader's right eye corner). It is reasonable to assume that they would have applied more than one layer of black paint over a base coat. I still think that they used something lighter than gunmetal on the nosebridge and inside the nose, and might be able to illustrate why I think that. I don't suppose anyone has noticed anywhere where the paint has been rubbed off so much that one can see the underlying resin of the casting? Yes, of course. I thought that was already discussed a few years ago. They used a white/beige (depending on the hue when shown) colored resin (or gelcoat). You see it on Vader's damaged faceplate, dome and chestbox. You also see the same white/beige colored resin on fiberglass props they built for ANH in several behind the scenes photographs and videos. I've seen it for C3PO and the Death Star droid but do you have any clear examples you could show from the ANH armor set? Well an example of seeing the resin but that's not a studio piece.